I have been researching the expenses associated with the 25 BDCs that I follow to see which ones can deliver more return to shareholders. BDCs with lower cost structures can pay higher dividends without taking on more risk. This is a follow up to "Part 1" where I measured operating expenses as a percentage of assets and income but did not adjust for leverage which I will do in the remainder of the series. This article will focus on the 19 externally managed BDCs that I follow, taking into account base management and incentive fee agreements paid to the management company for each. Externally Managed: pay expenses and fees to a management company that is not required to provide shareholders with compensation information. A base management fee is calculated based on a fixed percentage of assets under management (ranging from 1% to 2% of gross assets). Compensation information is not disclosed, and shareholders do not have the ability to vote on compensation issues. Other annual operating expenses are calculated in addition to the base management fee. Incentive fees of 20% of pre-incentive fee net investment income and realized capital gains are paid to management after a "hurdle rate" is achieved. Lower yield and 'safer' BDCs generally charge lower base management fees due to lower expected yields from investments and to shareholders. This would include Golub Capital BDC (NASDAQ:GBDC), Solar Senior Capital (NASDAQ:SUNS) and PennantPark Floating Rate Capital (NASDAQ:PFLT), all of which have lowest average yields on debt investments (below 10%) and the lowest base management fees between 1.000% to 1.375% of gross assets. 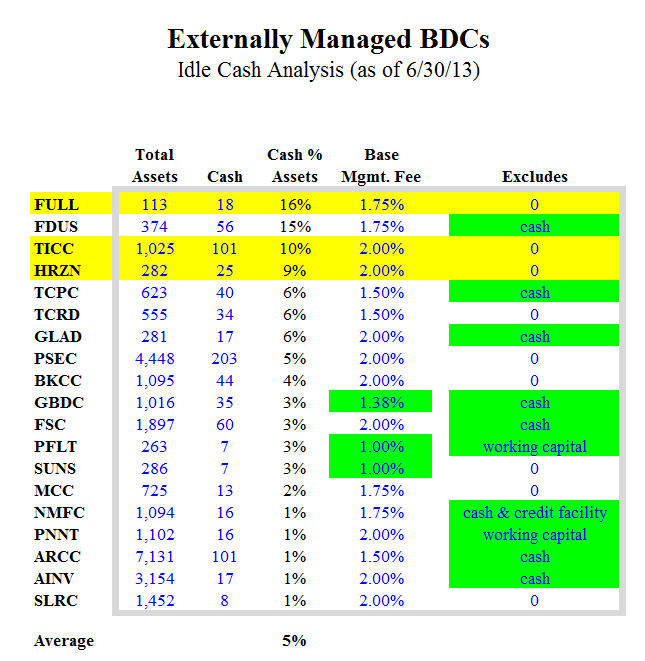 Most of the other BDCs are 1.75% to 2.00% but have portfolio yields of 12% or higher. The other key variance is how gross assets are calculated, with some BDCs (usually higher quality ones) deducting cash or working capital from total assets and New Mountain Finance (NYSE:NMFC) excludes amounts borrowed on its credit facility which is very beneficial to shareholders. The point is that investors should not have to pay management fees on idle cash that is usually a small portion of overall assets. However at the end of last quarter there were three BDCs with cash of around 10% to 16% of total assets and management fees that investors paid around 2% for idle capital. 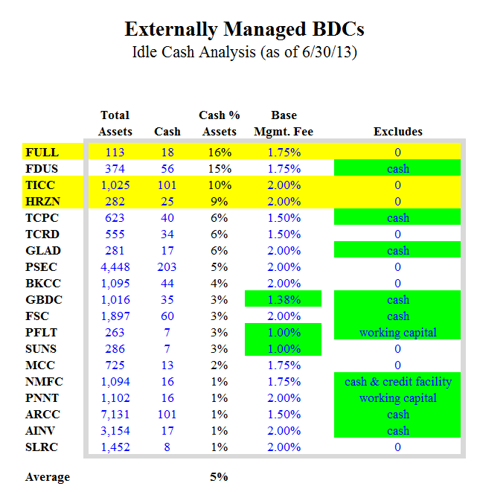 The table below ranks each BDC by the amount of cash as a percentage of total assets along with the management fee and exclusions. I believe both THL Credit (NASDAQ:TCRD) and Full Circle Capital (FULL) waived or adjusted a portion of the fees year-to-date but TICC Capital (TICC) and Horizon Technology Finance (NASDAQ:HRZN) both had much higher management fees as a percentage of income than the others as discussed in Part 1. Incentive fees are a bit more complicated and I will cover them at a high level in this article. There are two portions to the incentive fees for each company and the recurring portion is related to the amount net investment income ("NII") before paying the incentive fees. Each BDC has different hurdle rates before paying these fees but then there is a 'catch up' that is usually 100% of NII over the hurdle up to a point that pays 20% of pre-incentive fee NII and then it is a simple 20% of income after that. 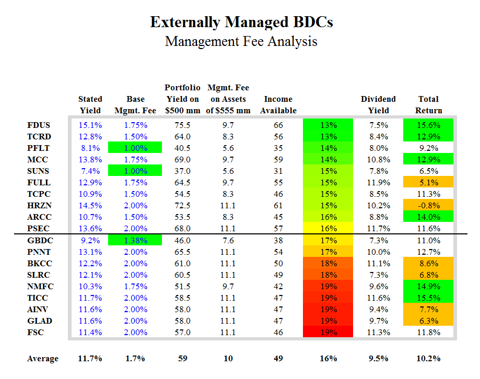 Most BDCs have been hitting the hurdle rates and paying the full 20% so it is consistent for all externally managed BDCs but there are three outliers. Two of which are SUNS and PFLT, both with limited operating histories and lower yielding as discussed earlier. The other is TICC that calculates its hurdle rate as "For each year commencing on or after January 1, 2005, the annual hurdle rate has been determined as of the immediately preceding December 31st by adding 5.0% to the interest rate then payable on the most recently issued five-year U.S. Treasury Notes, up to a maximum annual hurdle rate of 10.0%. The current hurdle rate for the 2013 calendar year, calculated as of December 31, 2012, is 5.72%" and then the fees are 20% of all NII over the hurdle rate. The second portion of the incentive fees are 20% of one-time realized gains and usually worded as "determined and payable in arrears as of the end of each calendar year and is calculated at the end of each applicable year by subtracting (NYSE:A) the sum of the Company's cumulative aggregate realized capital losses and aggregate unrealized capital depreciation from (NYSE:B) the Company's cumulative aggregate realized capital gains. If such amount is positive at the end of such year, then the Capital Gains Fee for such year is equal to 20% of such amount, less the aggregate amount of Capital Gains Fees paid in all prior years. If such amount is negative, then there is no Capital Gains Fee for such year." I decided to focus on only the management fee since incentive fees seem to be consistent with each BDC paying around 20% pre-incentive NII (and excluding one-time capital gains) assuming each BDC meets the hurdle rate and 'catches up'. The other two large expenses of an externally managed BDC are interest expense and other G & A which I will focus on later in the series. I then looked at a scenario where each BDC had a portfolio of $500 million yielding income at their current rates and then deducting the amount of management fees based on current agreements to see how much was leftover to pay incentive fees, interest expense, other G & A, and ultimately the shareholders. In order to come up with management fees I assumed that each BDC had a portfolio that accounted for 90% of total assets which is the current average. This would equate to total assets of around $555 million to support the $500 million portfolio. The table below shows the results ranked with highest income available for other expenses and shareholders. Obviously the higher yielding portfolios generate higher amounts of income but I was looking to see which BDCs had lower expenses as percentage of income assuming the same size, leverage, and operational history running at a full yield from its portfolio using their current rates and fee agreements. The average management fee would be around 16% of total income. Other G & A for externally managed BDCs averages around 5% to 6% of income for the more mature companies and interest expenses depends on the amount of leverage leaving only the 20% incentive fee to be deducted before benefiting shareholders. Shareholders should be aware of the expenses that each BDC pays especially the larger recurring ones that have wider variances between each company. After taking into account portfolio yield, BDCs such as Fidus Investment (NASDAQ:FDUS), Medley Capital (NYSE:MCC), TCP Capital (NASDAQ:TCPC), TCRD, PFLT, SUNS, and FULL, could have the ability to pay higher dividends as a percentage of income to shareholders. The goal is to provide investors with the maximum amount of return for the risks associated with each. In the remainder of this series I will analyze which BDCs will outperform with higher amounts of leverage as well as the ones that are the most inefficient. Disclosure: I am long MAIN, PSEC, ARCC, NMFC, TCPC, TCRD. I wrote this article myself, and it expresses my own opinions. I am not receiving compensation for it (other than from Seeking Alpha). I have no business relationship with any company whose stock is mentioned in this article.